A draft Masterplan for Ayrshire Park in Middle Boambee that aims to encourage more sporting use, create a more attractive parkland space for passive enjoyment and enhance the natural environment will be out for public comment from Tuesday, April 16, until Tuesday, May 28. 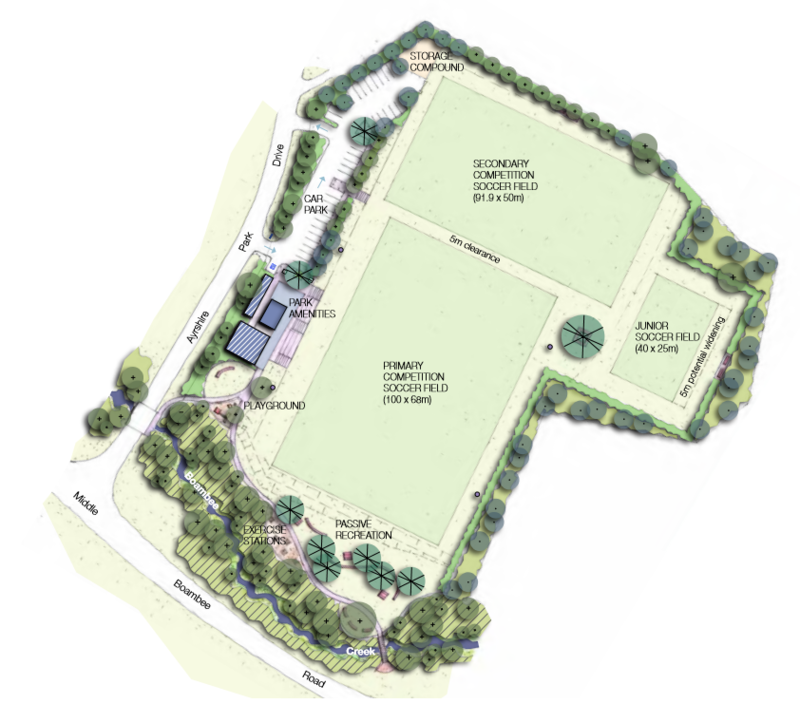 “This new draft Masterplan for the park will transform a very well-loved, but tired sports ground into an open space that offers attractions for the whole community,” said Coffs Harbour Mayor, Councillor Denise Knight. “We’ve been working with key users of the park for some time and they’ve been really helpful in giving us a clear idea of how the park should be reinvigorated. Ayrshire Park is in Middle Boambee and was created from land donated to the community by the Hull-Moody family in the 1980s. As well as the open space and community facilities, a length of Boambee Creek borders the park giving it a significant and potentially very appealing natural feature. Enhancing the existing facilities to support the sporting use, while incorporating new features to encourage more passive uses such as walking and picnicking. Improving site organisation and function with better pathways, improved car parking and enhanced spectator seating. Enhancing the environmental values by planting more native vegetation in unused mown areas and restoring and expanding the riparian vegetation along the creek banks. Improving safety and security by maintaining high levels of passive surveillance. The capital improvements suggested in the draft Masterplan would need to be considered against Council’s other funding priorities within future budgets. Interested residents can view the draft Masterplan and make a submission by going to Council’s Have Your Say website at https://haveyoursay.coffsharbour.nsw.gov.au/ Copies can also be viewed at local libraries and at Council’s Customer Service Centre in Coff Street.